A team of researchers led by Hiroshi Saito, a senior associate professor at the University of Aizu, is developing an artificial intelligence system to detect the whereabouts of potentially harmful wild animals, such as bears, and to notify people via email of the presence of animals nearby. To start, the researchers chose bears as the subject of the detection. If the system is put into practical use, it could reduce damage to agricultural crops and fears about harm to humans. 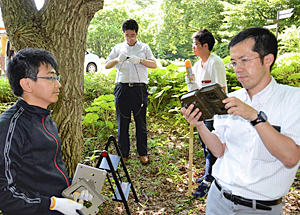 On July 9, the team of researchers began a demonstration test to detect the locations of bears in Aizu Recreation Park in Aizuwakamatsu, Fukushima Prefecture. Four researchers, including Saito, set up an automatic camera on a tree near a botanical garden in the park, where bears have been spotted. The camera detected body temperature and movement from about 10 meters away, and took photos of the objects. The researchers confirmed that the photos were transmitted to their smartphones and university computers. The team's research is a part of the Strategic Information and Communications R&D Promotion Program (SCOPE), which is a project of the Internal Affairs and Communications Ministry mainly for technological developments in fields of information and communication technology. In addition to Saito, who is the team's representative, Yoichi Tomioka, an associate professor, and Yukihide Kohira, a senior associate professor, participate in the team of researchers. A researcher on the team said that the research and development program for detecting wild animals is rare in the nation in that the system includes distribution of emails. In the system, a combined set of sensors to detect animals, the small camera, a computer system, wireless equipment and other tools will be set up at the observation location. But one hurdle is that burdens on the computer system will be heavy, because the computer system will have to process a huge volume of data if all of the graphic information detected by the sensors is input. The team of researchers aims to resolve the issue by utilizing the AI technology of machine learning. An AI program, in which tens of thousands of pieces of graphic data of bears is accumulated, is installed in the detection system, so that the system will be able to detect and photograph only bears. By changing the kinds of graphic data accumulated in the AI program, the detection system can be used also to detect other animals, such as boars and deer. Information about detection of bears is distributed to local governments, police, nearby schools and local residents via a server in the university. People can access the information around the clock on a website or on their smartphone screens. The team of researchers is also trying to develop a system that will display the times and places of appearances of bears together with maps. The team of researchers anticipates that the detection devices will be set up in such places as border zones between mountains and residential areas, and areas along rivers. The team aims to complete the development of the detection devices by the end of this fiscal year. Saito said that if the system is realized: "Damage by wild animals can be reduced. It can also wipe out fears among local residents, especially children, and make them safer."